Surveillance video of the June 2017 stabbing of Shamieke Pugh and Maurice Lee by Gregory Reinke went viral after it was made public in January 2019. Columbus, Ohio (Apr. 3, 2019) – Two men who were stabbed several times inside of the Southern Ohio Correctional Facility while they were handcuffed to a table but their attacker was not, filed a lawsuit today in federal court against Southern Ohio Correctional Facility Warden Robert Erdos, as well as some of the jail’s prison guards and nurses. The lawsuit alleges that the defendants violated the two men’s civil rights by failing to protect them from the attack and failing to treat the injuries they suffered when they were stabbed. Surveillance video of the attack, available at http://bit.ly/PughVideo, went viral after it was made public in January 2019. According to the complaint, Shamieke Pugh and Maurice Lee were permitted to have indoor recreational time at the Southern Ohio Correctional Facility on June 4, 2017. As was the process at the jail, both men were strip searched by guards before they were allowed out of their cells. 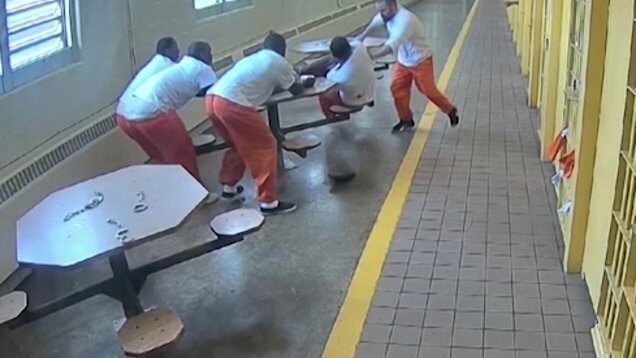 They were searched and then handcuffed to a table along with two other inmates where they and the other inmates—all African-American males—peacefully played a card game. While playing cards, Mr. Pugh and Mr. Lee noticed prison guards laughing and talking to another inmate, Gregory Reinke, inside of his cell. Reinke is a known white supremacist and member of the Aryan Brotherhood. The guards then allowed Reinke to leave his cell and sit at a table behind Mr. Pugh and Mr. Lee and the other inmates without first strip searching Reinke or handcuffing him properly to the table. In fact, the defendants gave Reinke a key or a tool that allowed him to quickly unlock the handcuffs or knew or should have known that he had such a tool in his possession. Then, according to the complaint, after 20 or 30 minutes, Reinke removed his handcuffs. He then pulled an 8-inch blade out of his sock and began to violently stab Mr. Pugh, Mr. Lee, and other inmates several times. Because Mr. Pugh, Mr. Lee, and the other inmates were handcuffed to the table they were sitting at, they could not defend themselves. Despite watching Mr. Pugh and Mr. Lee be stabbed at least ten times and two times, respectively, by Reinke and standing a mere 10 feet away behind a locked door, nearby prison guards laughed and did not stop the attack. In fact, only after one of the stabbing victims was able to tackle Reinke did the prison guards intervene. That stabbing victim was pepper sprayed by guards but Reinke was not. For approximately ten to fifteen minutes, no prison guards sought medical attention for Mr. Pugh, Mr. Lee, or the other stabbing victims despite Mr. Pugh being so injured that he spent two weeks at the Ohio State University Hospital to recover from his wounds, and Mr. Lee also requiring hospitalization for his injuries. The complaint also alleges that when Mr. Pugh sought medical treatment at the jail on a separate occasion in June 2018 for chest pains, he was kicked, punched, and stomped by a number of prison guards. The guards allegedly beat Mr. Pugh after prison nurses accused him of faking his pain and lying about his conditions. According to the complaint, at least one prison nurse whispered to the prison guards that the nurse would “cover for ya’ll” and that the nurses were going to then leave the room so that the guards could be alone with Mr. Pugh. Mr. Pugh’s and Mr. Lee’s legal claims against the various prison officers named as defendants include that they (i) failed to protect them from being attacked; (ii) prevented them from receiving medical attention; (iii) treated Mr. Pugh, Mr Lee, and the African-American inmates differently than they treated a white inmate based on their race; (iv) conspired to deprive them of their constitutional rights; (v) engaged in cruel and unusual punishment; and (vi) failed to intervene and protect them from harm. Mr. Pugh’s and Mr. Lee’s legal claims against the various prison nurses named as defendants include that they (i) failed to intervene and protect them from harm; (ii) showed a deliberate indifference to their serious medical needs; and (iii) conspired to deprive them of their constitutional rights. Mr. Pugh and Mr. Lee also allege that Warden Ronald Erdos and an unnamed sargeant should be liable for the actions of the other defendants here whom they supervise. The lawsuit, captioned Pugh, et al. v. Erdos, et al., No. 19-cv-00245, was filed today in the United States District Court for the Southern District of Ohio. Excolo Law is a group of legal professionals aiming to bring to justice those who put their profits and gain before the good of the people Excolo Law serves. Partnering with equally dedicated law firms, Excolo Law is leading the fight against corporations, government offices, and others who are deliberately compromising consumer safety and the legal rights of individuals. For more information, please visit www.excololaw.com or call 866-9-EXCOLO. Walton + Brown, LLP takes pride in having a successful serious personal injury and civil rights practice, unafraid to step into a courtroom and litigate cases to the fullest extent necessary. With over 450 lawsuits filed and over $18 million in settlements or verdicts won for our clients, we bring a record of success. Sean Walton and Chanda Brown have been awarded Top 100 and Top 40 Under 40 designations as trial attorneys. For more information, please visit www.waltonbrownlaw.com. Optimum Law Group and its attorneys seek to right the wrongs that have been committed against our clients. We believe in providing our clients with aggressive and thorough legal counsel. We also believe that our clients must be treated with respect and be provided with individual attention so that they can fully understand all of their legal rights and the paths available to them to enforce those rights. For more information, please visit www.optimumlawgroup.com.